The five steps to the home buying process, explaining the different parties, fees, and other surprising things that pop up when trying to buy your first house. 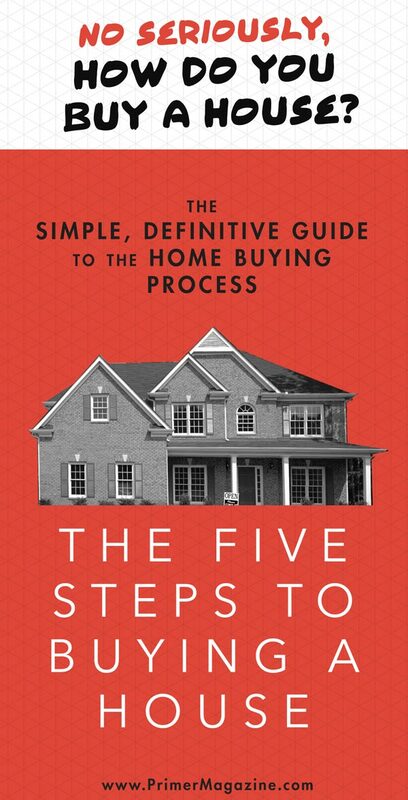 You can also download our free 16 page ebook that covers the 5 steps of buying a house. Click here to download! If you reached this article by googling “How do you buy a house?” or “Steps to buying a house” then don’t feel ashamed: this is a safe space. Besides, buying a house isn't exactly a simple process. It's not like buying a hamburger, where you exchange a predetermined amount of money for a specific good and/or service. When you buy a house, you're assuming ownership of a piece of property with money you probably don't have and at a price that nobody's quite sure of. And it's not just you doing this. It's you and an army of loan officers, real estate agents, settlement attorneys, inspectors, appraisers, and all sorts of other professionals who work day and night to make these deals happen. All that withstanding, the home buying process is heavily-trod ground. Your family and friends collectively have dozens of house purchases under their belt, and each one of them probably has a nugget or two of wisdom to pass on to you, solicited or otherwise. But all of that hodgepodge of anecdotal advice can actually be a detriment to your understanding of the specific steps you need to take to buy a house you’ll be happy with. No doubt, mom and dad will have gobs of advice for you. But understand that their advice will be inflected through their own experience from when they bought your childhood home three decades ago; it may not be applicable to your specific situation. Times have changed. The job market has changed, the real estate market has changed (see: 2006 housing crisis), the rules of lending have changed (again, see: subprime fallout), and most importantly, the lifestyle of post-college graduates in their 20s and 30s has changed. So, here’s what we’re going to do in this article. We’re going to walk through the major steps of buying a house and discuss them at a very high level. We’ll take dad’s advice on what you should do and validate it or update it as warranted. 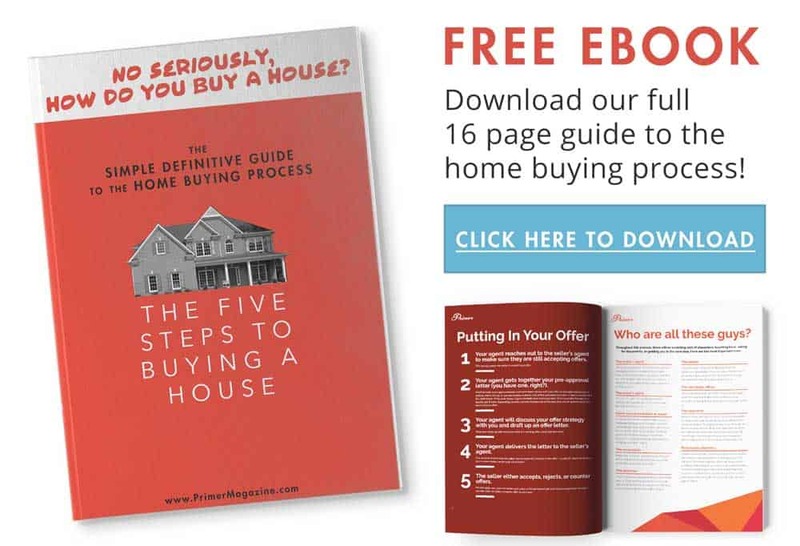 By the end of this piece, you’ll have a clearer big picture understanding of the home buying process and the next steps to take to make it real for you. This might seem obvious, but many would-be homebuyers don’t give this decision enough critical thought. Shopping for homes when you’re not emotionally, financially, or logistically ready to own a piece of real estate guarantees dissatisfaction. So, no matter what stage you’re at in the process, take a step back and decide if this is the right move for you. Your dad's advice: Traditionally, homeownership has been the penultimate step in the journey to responsible adulthood. You graduate from college, you get a job, you get married, you get a house, you raise a family. Getting a house with a 30-year mortgage means you’re settling down, easing into the groove of the rest of your adult life. In dad’s eyes, buying a home is both fiscally and symbolically responsible. It’s a sign of maturity and commitment. Of course it’s what he wants for you. Our advice: It does make sense to find a home that’ll meet your needs for the rest of your life and lock in a low interest rate mortgage for the next 1/3rd of a century. But nobody does that with their first home anymore. That’s because all the things that settling down is contingent upon have changed: jobs, relationships, housing markets, and the general outlook on life for young professionals. The press likes to call us “the job hopping generation.” According to a Gallup poll, “21% of millennials say they've changed jobs within the past year” and only about half of millennials say they plan to work for the same company in the next year. Meanwhile, the median age for marriage is about 27-29, compared to 20-23 in the 1960s. Locking things down in your career and relationship when you are in your early 20s just isn’t likely anymore. That doesn’t mean that you shouldn’t buy a house. It just means you should have different goals when buying a house. Kevin Lawton is a Realtor with Coldwell Banker Schiavone & Associates in Bordertown, NJ who works with millennials and is a millennial himself. As Lawton explained to Primer, the thing that first-time homebuyers should really be thinking about is their second home. “It is incredibly important for first time home buyers to be able to create some equity in the home because most likely they will not live in it their entire life,” he says. We could dedicate a whole article to the rent vs. buy equation, and we will. But for now, consider the five-year rule of house buying. That is, when deciding to buy a home, assume that you’ll stay in it for at least five years. This is a general rule of thumb, but it acknowledges the fact that you aren’t going to stay put for the next 30 years. Chances are, you are going to be making a little bit more money each year and learning a bit more about what path you want your life to take. As you follow your next job or next passion, you might find yourself in another part of town or another part of the globe. The anxiety that often drives first-time homebuyers into the market is that by renting, they aren’t building equity. But by moving in and out of houses every three years, you’re not building equity either. What you are doing is paying closing costs, agent commissions, and moving fees over and over. Takeaway: Think realistically about where you’ll be in the next five years before you decide to buy a house. Instead of building deep-seated roots, think about building equity. If you can’t do that, remaining a renter may actually be the more fiscally responsible way to go. So, what is home equity anyway? When people talk about homeownership as an investment, they are talking about building home equity. Home equity is simply the value of your home that exceeds the amount that you owe on the home. The equity of your home starts with the down payment you make on the house: you buy a $300,000 house with a $60,000 down payment and a $240,000 mortgage, and you have $60,000 in equity. Pay down your principal. That is, owe less on your home. For most 30-year mortgages, this doesn’t start happening until you’ve made about five years of payments. Until then, you’re mostly paying interest. Renovate your home. That is, increase the value of your home through improvements. This is often called sweat equity: add a bathroom, update the kitchen, build an addition, attach a deck, etc. Ride the market. That is, increase the value of your home through market movements. You can boost the value of your home without doing anything to it all, as long as the neighborhood you’re in becomes more desirable. In the short- to mid-term, this can be due to revitalization or development of the area. In the long term, it could be due to overall improvements in the housing market. With all of these, there’s the potential to both build and lose equity. If you get a mortgage with a high interest rate or unfavorable terms, you could actually owe more on your home as you make timely payments. (And don’t forget closing costs: those don’t build equity at all.) Or you could pay $30,000 for an addition that only increases the value of your home $20,000. Or demand for homes in your area can tank, and the market value of your property can go down. There are a bazillion homes for sale on the market and the sky’s the limit. But not really. The biggest limiting factor is going to be your budget. To save yourself an immense amount of time and heartache, it makes sense to only look at houses in your price range. And to do that, you have to determine what your price range really is. Find out how much house you can afford with Nerd Wallet’s calculator. Getting pre-approved does essentially that: A bank or lender takes a look at your finances and gives you a letter saying how much they’d loan you without you actually applying for the loan yet. This takes the mystery out of the equation so you don’t get to the point of closing a deal and then, oops, looks like you don’t qualify for your mortgage. Dad’s advice. Go down to the bank and tell them you want to buy a home. The bank will interview you about your income and your assets and they’ll tell you how much of a loan they’ll give you. Our advice. Dads right on this one, too. You should absolutely meet face-to-face with a lender as early in the home buying process as possible. Even if you haven’t quite wrangled up your paystubs and taken stock of your savings, going through the pre-approval process will get you to that point. The bank wants to get an idea of your financial picture, and one of the side benefits of providing this all to the bank is that you get a clearer view of your finances as well. 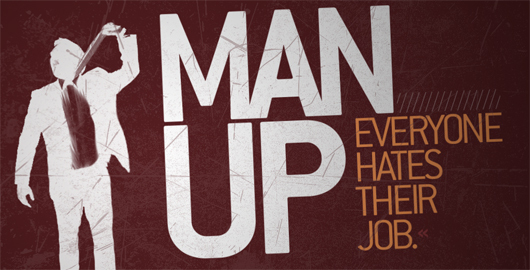 But here’s where life gets easier for you than it was for your dad. Evan Harris, co-founder of San Diego-based SD Equity Partners, told Primer: “In today’s market, the borrower can interview the bank and not the other way around.” That’s because your choices extend way, way beyond the one branch down the street from where you live. Online mortgage lenders and traditional mortgage lenders with an online presence allow you to choose from hundreds of different loan options. Getting a loan online can seem a bit shady, but there are a number of lenders that have built a solid reputation servicing loans on the internet. Even if you don’t choose to get your mortgage online, these sites can be helpful in gathering information so you can negotiate a lower rate with the lender you do choose. Quicken Loans / Rocket Mortgage – A completely online mortgage process that lets you provide your financial information and apply for loans without all the paperwork and meetings. Lending Tree – Essentially a mortgage lender search engine. Input some information and browse loans from a number of different banks and lenders. Guaranteed Rate – Offers the so-called “digital mortgage.” They also have brick-and-mortar offices if you want to talk face-to-face with a mortgage officer. Capital One – One of the top dogs in online checking also offers online mortgages. Note that we’re not completely ruling out an in-person visit to a lender or mortgage broker’s office. Financing a home is a complicated process, and having an expert available to answer your specific questions and think critically about what’s best for you is extremely valuable and you won’t get that online. Also remember: getting pre-approved by a bank doesn’t marry you to them or the number they’ve given you. Just because you can get a $500,000 loan doesn’t mean you should. (When you put all your money into your house and have nothing leftover, that’s what we call “house poor.”) And just because Bank A wrote you the pre-approval letter doesn’t mean you have to get your mortgage from them—you are completely free to take your business elsewhere. It will be easier if you go with Bank A since they already have your information, but if Bank B offers a better rate, take it. Takeaway: Before you begin shopping for a home, start shopping for a lender. You’ll learn about what you can afford and get the ball rolling on getting a good deal on financing. Plus, when it comes time to make an offer, the seller will know you are serious. How much money do I need to save to buy a house? Down payment. Most people shoot for a 20% down payment. This qualifies you for a conventional loan without private mortgage insurance – insurance that protects lenders if you default – which means you’ll pay less on your monthly mortgage bills. Different loans have different minimum down payments, and some have no down payments, so research your options. Contractor and professional fees. This is the incidental stuff you’ll need to pay for: home inspections, movers, handyman repairs, etc. Home inspection costs vary by state—for instance, in New York City averages $1,025 while Austin, Texas averages $452, which is closer to the national average of $473 according to Angie’s List. Home repairs vary by the age and size of the house, but HGTV recommends setting aside 1 to 3 percent of the value of the home each year for repairs. Money set aside to invest into your home. This is optional, but highly recommended. If you want to build equity in your home, plan renovations before you buy and make sure you have enough cash leftover to make it happen. This is a separate bucket from the home repairs savings—replacing carpet or installing a new roof will not increase the value of your home. Nothing beats getting pre-approved, but if you are still trying to get a feel for the financial magnitude of a home purchase, check out the following: Online Mortgage Calculator, Amortization Schedule Calculator, Down Payment Calculator. One last thing: Your credit score matters as much as your savings in the bank. Take time to sort it out. It’s free and good to know if you don’t already. A real estate agent is your guide through the thicket of the home search and home buying processes. Although you’ll work with a rotating cast of characters on the way to buying a home, your real estate agent will be there from the beginning to the end and that’s a good thing. As a buyer, working with a real estate agent costs you nothing. Practically every home on the market is going to have a listing agent. Typically, the commission on a home sale is 6% of the sale price, and that comes out of the money you pay the seller. The buyer's and seller's agents split the commission from the home, and if you don’t have an agent, the seller’s agent just keeps the other half. For example, on a $300,000 home with a 6% commission, you pay $300,0000, the listing agent gets $9,000 (3%), the buyer’s agent gets $9,000 (3%) and the seller gets the remaining $282,000 (94%). The cost of the home to you is exactly the same as if no one had used an agent at all. Given the value that a buyer’s agent will provide you in accessing homes for sale, negotiating offers, and shepherding everyone along through the red tape, there’s practically no reason not to work with a buyer’s agent. One last thing: I know what you’re thinking. “If I don’t use a buyer’s agent, then I can convince the seller to knock off 3% of the purchase price, right?” Maybe. But probably not. And even if you do, that’s only one point you’re negotiating. A buyer’s agent can negotiate other terms of the sale that may save you more than the 3% commission. Dad’s advice: How do you find a good real estate agent? Easy: referrals. Our advice. Referrals are a good place to start when looking for a buyer’s agent, but take all recommendations with a grain of salt. Everybody has a friend or relative that works in the real estate business, and referring them to you could very well be more of a favor to the agent than to you. Local real estate markets are extremely unique down to the neighborhood or even the street, and what matters to you is finding a real estate professional who has the skills and experience in the markets you want to access. And, above all, chemistry with your real estate agent matters. Remember: your agent is going to be with you through the entire arc of your home buying process. It can be an emotional journey with twists and frustrations at every turn. The ability to communicate your needs and stay on the same page with your agent is critical. So, how do you really find a good agent? Interview them. (Future article to come.) Interview many of them. Find one you like, and if things aren’t working out, fire them. Takeaway: Your agent is your most important ally and advocate in the home buying process. Be equally critical and deliberate in choosing your agent as you would be in choosing your home. Because ultimately, choosing the right agent will play a huge role in getting the home you want. Finally, here we are: house hunting. What you may have thought was step one is actually the second-to-last step. It is, of course, the most important step: viewing homes, finding one that fits your budget and needs, and then putting in a strong offer. Dad’s advice. Have your agent find you houses and schedule a couple weekends of house showings. Our advice. Dad’s right that an agent plays a crucial role in getting that house that checks all the boxes off your list. But when it comes to finding homes you’re interested in, you can and should take more initiative. So, what purpose does the real estate agent serve, if not to find you houses for sale and bring you in to see them? It’s all about closing the deal. Whether it’s a buyer’s market or a seller’s market, how and when you put in your offer can make or break your chances of getting that house you want. There are three aspects you need to balance out: (1) making sure your offer is taken seriously (2) making your offer attractive enough that the seller accepts it and (3) getting a good deal. An agent can help immensely with each of these elements. The internet can give you all the hard information about a home for sale, but the agent is your only source for the soft information about the listing and the sellers. An agent can draw on their own knowledge of the market and their interaction with the listing agent to glean crucial details about the seller’s situation that aren’t reflected in the raw numbers in the listing. In local markets, your agent may already have a rapport with the seller’s agent, which can help fast track you to an acceptable offer. “Nowadays, a realtor's job isn't about finding clients a house. Their job is to get the house they want,” says Kang. There’s nothing worse than putting in an offer on the home of your dreams only to have it snatched away by another buyer. A good agent will help you put in your strongest offer so that doesn’t happen. Your agent reaches out to the seller’s agent to make sure they are still accepting offers. This usually preps the seller to expect your offer. Your agent gets together your pre-approval letter (you have one, right?). You’ll include a pre-approval letter and some hand money with your offer so the seller knows you’re serious. Hand money, or earnest money, is about 1-2% of the purchase price that is held in escrow until the deal closes. If the deal closes, it goes towards your down payment. If the deal falls through, you usually get it back, depending on who and why backed out of the deal (this will be spelled out in the terms of your offer). Your agent will discuss your offer strategy with you and draft up an offer letter. Once you come up with what you think is a winning offer, you’ll sign the letter. Your agent delivers the letter to the seller’s agent. The amount of time that the seller has to respond is laid out in the offer—usually it’s about three days, but in some cases can be only a few hours. The seller either accepts, rejects, or counter offers. For the latter two, you can either walk away at this point (and get your hand money back), accept a counter offer, or make a counter offer of your own. Once the offer has been accepted, the house is considered “under contract.” Houses under contract or pending sale are off the market, but the property is often still marketed until closing. That’s because during this period because there’s still a reasonable chance that the sale won’t go through. Both you and the seller have obligations to follow through on before the sale is final. The steps under contract include getting your mortgage finalized (fairly simple if you’re preapproved) and then bringing in your guy for the pre-sale home inspection (more below). The bank will also send in an appraiser before closing your mortgage, and depending on where you live, you may need to get a few other assessments done to satisfy local real estate transaction requirements, such as a dye test or a survey. After that, it’s closing day. You show up to the table, sign about a million papers, hand over a big ol’ check (you did remember to get the money transferred out of savings, right?) and then get the keys to your new pad. Usually, you can move in right after closing, but this varies by state and county. In some areas, you’ll have to wait until the real estate office records the title (could be a few days). Or in other cases, you may have negotiated a period where the seller rents the house back from you for a few days while they get organized for their move. Dad’s advice. Get your agent to refer a home inspector and settlement company to you. They’re familiar with the business and will pick professionals that will help the deal go through smoothly. Our advice: We hope that by now you’ve picked a real estate agent that you like and can trust. But still, it behooves you to choose your own home inspector and maybe even your own settlement company or attorney. This is because there’s the potential for a conflict of interest—conscious or otherwise—if your real estate agent chooses these pre-sale professionals for you. Remember: an agent doesn’t get paid unless the deal goes through. So, they might refer a home inspector who works quickly and perhaps doesn’t get too nitpicky in pointing out items in disrepair on a home. But truly, you do want that detail-oriented home inspector. Yes, finding issues with a home can slow down or even kill a deal. But it pays to take your time with this and get all items addressed to your satisfaction. If moderate to major issues are found, it’s not unreasonable to ask for an extension on the contingency period while you weigh your options and get bids on repairs. Taking time to gather as much information as you can will help you and the seller reach an arrangement that will preserve the deal. Likewise, real estate agencies or lenders usually have a favorite settlement agency or title company. These are the folks who shuffle the paperwork necessary to transfer the deed. While this may seem straightforward, there are ways to screw it up, and the fees do vary. You have every right to shop around for a title company. That being said, it’s completely reasonable to go with the title company that your real estate agent or lender prefers—choosing a company that is experienced and trusted will help the closing go smoothly. It may be tempting to go with a title company you found on the internet that has slightly cheaper fees, but the burden of vetting an unknown company will fall entirely on you. Buying a home is a lengthy, complex process with many ups, downs, variables, and curveballs. 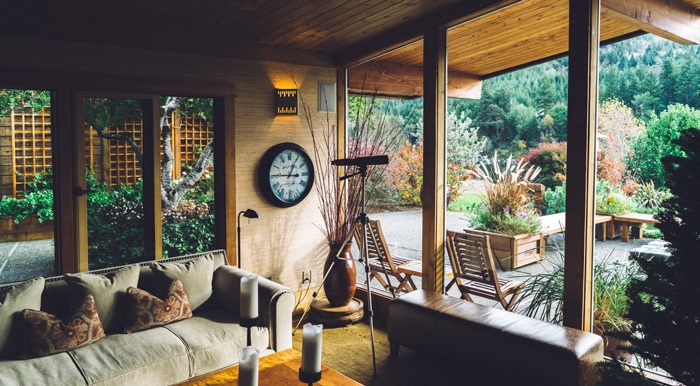 Your best bet in navigating the home buying process and closing on the perfect home at the perfect price is to remain aware of what step you’re on and where to focus your energy. In most cases, the person you’ll turn to is your real estate agent, so choosing an agent that understands your goals and communicates well with you is crucial. The next most important relationship you’ll have is with your lender. No matter how lost you feel, as long as you’ve properly decided what you want out of a home and wisely selected a real estate agent and a mortgage lender, the home buying process will go as smoothly as possible for you. Don’t get me wrong—there is always more homework to do. But these are the most important areas to begin focusing your energy. The mortgage officer. This is your main point of contact. They may delegate some of the administrative tasks, but for general questions and negotiating rates, this is the person to talk to. The appraiser. Before closing the loan, the bank will hire an appraiser to confirm the value of your home, since that is what’s securing the loan. The appraiser works for the bank, so there’s nothing you can do to sway their opinion other than answer the door when they come knocking. You can hire your own guy and have your own appraisal done, if you want, but it’ll be for your information only. Home insurance broker or agent. You’ll need home insurance in order to get a mortgage. Although your insurance company will be independent of your lender, they’ll need to talk to each other to set up your mortgage payment and close your loan. Your home insurance is typically rolled into your monthly mortgage payment. Step 4. Real estate attorneys. If you’re working with a real estate agent, they probably have their own legal department and you’ll use their standard forms and contracts. If you are flying solo or just being really diligent, you can hire your own attorney to review and draft documents and performing legal searches on properties to ensure they are free of liens and unpaid taxes (though this is also done by the title agent). Step 4. Settlement and title agent. This is a separate company from your real estate agency. If you don’t have your own real estate attorney, they’ll handle the paperwork and legal side of processing the transaction. Step 4. Was this post helpful? Please share it! It's an easy way to help support us in creating more articles like this. Jack Busch lives in the Pittsburgh area where he writes and edits for fun and money. P.S. While I will never turn down business, this comment is not intentionally a way for me to promote myself, but to promote brokers in general. Brokers are licensed and have higher government-requirements (and go through rigorous annual training to stay licensed) than traditional loan officers that work at depository institutions. And while I cannot speak for every broker, our primary role is to work for the best interest of our clients and not for our bottom line. I second that! Funny enough, I am a Loan Originator here in Ohio working with a Direct Lender. We need licensed and continued education to stay active. At Depository Institutions their pay structure is different and less is required from them, work and knowledge-wise. Our biggest difference is working in the clients best interest, like Trey said. I refer clients out all the time if I cannot meet what they are trying to achieve through a refinance or purchase if i know someone can put them in a better situation. As someone who works in insurance (but not a licensed agent, I want to be clear on that), I believe getting homeowners insurance an important part of the home buying process. Don’t get the cheapest policy just because it’s cheap. You may regret it come claims time. Make sure you look at what it covers, and more importantly what it doesn’t. Also look at what kind of pay out you get, actual cash value or replacement cost. Your home is probably the biggest investment you’ll ever make. You need to protect it. VERY good point! I can speak on personal experience that replacement cost will get you further and ease your mind THAT much more in the end! Agreed. The peace of mind is so important. I carry more insurance than most because I’ve seen personally how bad things can be when you don’t have enough insurance. This is an interesting article. Well there are many home buying services in the UAE. A home buying experience can be very emotional especially because its the biggest investment you will be doing. Here is an intormative article that can add value to home buyers. Your mid-20's can be a rough time. 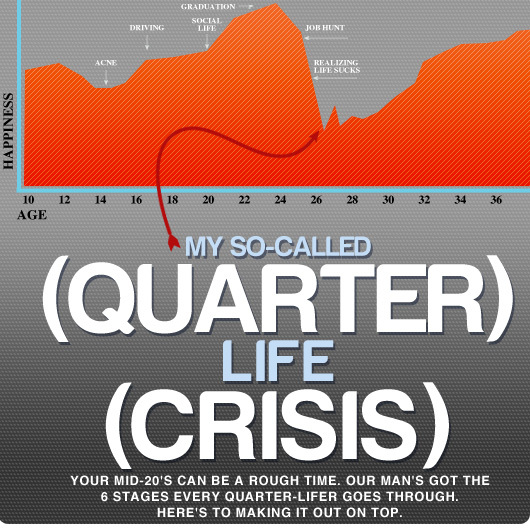 Our man's got the 6 stages every quarter-lifer goes through. Here's to making it out on top.